1. Palestinian tanna, to whom one reference occurs in the Mishnah (Peah ii. 6), from which it appears that he lived in the time of Hillel's descendants (comp. Heilprin, "Seder ha-Dorot," ii.). 2. Palestinian haggadist; grandson and pupil of Joshua b. Levi (Yer. Ber. ii. 3; Yer. Beẓah i. 6 et al.). From the few details concerning him it appears that on Saturdays he used to have himself carried to the synagogue in order to preach (Yer. Beẓah l.c. ), that he was not rich, and that he died suddenly in the time of Ammi (Ket. 85b). Me'asha is particularly noted for the vision which he is reported to have seen during a trance lasting three days, and concerning which he said: "I have been in a world of confusion where people who are honored here are held in contempt" (Ruth R. iii. 1). In Pes. 50a this vision is ascribed to Joseph b. Joshua b. Levi; Joseph was probably Me'asha's father. Me'asha inferred from Isa. xxxiii. 15-17 that when one shuts his eyes to things indecent he is worthy to view the face of the Shekinah (Pesiḳ. R. 24 [ed. 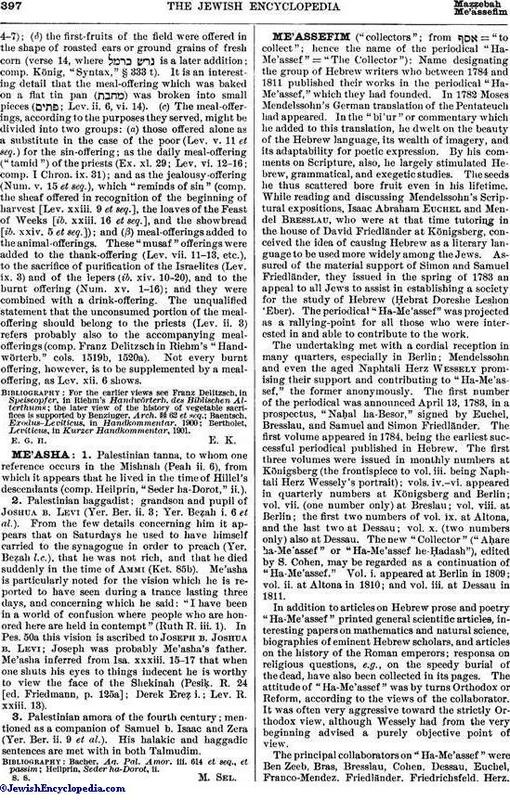 Friedmann, p. 125a]; Derek Ereẓ i.; Lev. R. xxiii. 13). 3. Palestinian amora of the fourth century; mentioned as a companion of Samuel b. Isaac and Zera (Yer. Ber. ii. 9 et al.). His halakic and haggadic sentences are met with in both Talmudim.